No other European nation has a more special relationship with the potato than Ireland. The first Europeans to accept it as a field crop in the seventeenth century, the Irish were the first to embrace it as a staple food in the eighteenth. The potato emerged strongly in Ireland because it suited the soil, climate and living conditions remarkably well. unemployment, poverty, overpopulation and land hunger. By 1780, at a population level of four million, those afflictions had helped push the potato to dominance. In 1830, young adult males in Ireland were consuming 5 kgs per capita per day – a matter of public record. By 1841, four years before the Famine, the population had literally doubled to 8.15 million – a phenomenal increase by any standard. Initially, reports describing the appearance of a mysterious disease on the potato crops in various parts of Europe in 1845 were regarded with curiosity rather than alarm within Ireland. In the previous year, a number of Irish newspapers had carried reports from American journals and newspapers concerning a disease which had attacked the potato crop there for a second consecutive year. Within Ireland, however, there was little response to the news that the same disease had apparently spread to Europe in 1845. On 20th August 1845, the curator of the Royal Dublin Society’s Botanic Gardens at Glasnevin in Dublin, David Moore, noticed the first signs of a disease on the potatoes growing in the gardens, thereby heralding the arrival of Phytophthora infestans (Potato Blight) in Ireland. (The Royal Dublin Society, a direct link to 1845, is still with us today and is the proposed venue for the World Potato Congress in 2021). Ominously, at the beginning of September, sightings of the disease were being more widely reported in Ireland. The events of 1845-52 which ensued in Ireland became known as the Great Famine and constituted a cataclysm unequalled in Irish history. With more than a million dead from starvation and disease, and more than a million in exodus from Ireland to Britain, North America and Australia, today Ireland remains one of the few European nations whose population is smaller than it was during the nineteenth century. One to one and a half million people left Ireland between 1845 and 1851 and as many as a further two million in the subsequent twenty years. The prime destination of the emigrants was overwhelmingly the United States, with approximately 80 per cent choosing to go there. Irish emigration became unique in its scale, duration and geographical spread. Furthermore, the effect of this diaspora on the social history of the destination countries was immense. For example, by 1850, New York, with more than 250,000 Irish-born residents, was the most Irish city in the world. Twenty-two US Presidents have had Irish roots. As Irish population figures crashed in the second half of the 19th century, endemic and pervasive emigration became the black hole at the centre of Irish culture. By the 20th century, emigration had eaten its way into the heart of the Irish experience. In summary, the impact of the Great Famine devastated Irish culture, language, social demographics, formed the basis for the massive Irish diaspora which in turn had a huge impact on the social history of destination countries and paved the eventual road to revolution and Irish independence. the book is the city of Dublin itself). 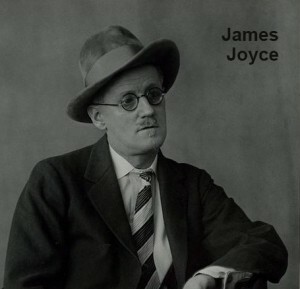 In 2015, Ireland’s National Broadcaster, RTE, asked its listeners to select their favourite Irish poem written in the last 100 years. 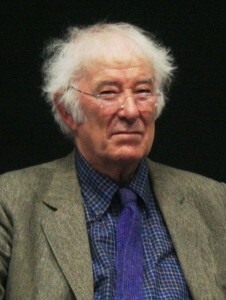 By an overwhelming majority, the winning poem was one written by Ireland’s Seamus Heaney, who was awarded the Nobel Prize for literature in 1995. The poem, a sonnet, is entitled “ When All The Others Were Away At Mass” and is about a time spent alone with his mother in the kitchen peeling potatoes. The author recalls this years later at her funeral and realises they were never closer than at that time. 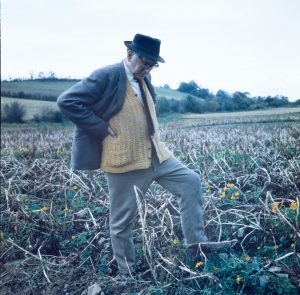 Pulitzer prize winning poet and author Paul Muldoon features the potato in ‘The Grand Conversation’; Poet Paul Durcan in ‘Christmas Day’; in ‘Paths’ by John Montague; Eavan Boland wrote ‘The Famine Road’. 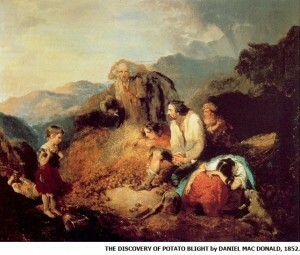 The potato has played an important role in Irish Art. 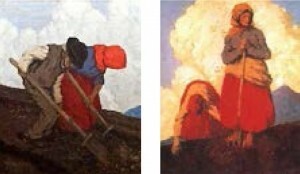 Achill Island’s (County Mayo) desolate beauty of the West of Ireland has inspired many Irish artists, including Paul Henry, whose well-known works “The Potato Diggers” (1910) and ‘The Potato Pickers” (1912) were painted on the Island. In summary, Irish life, art, literature and the potato are solidly interwoven.